On this web site, you will find information on, stories about and photos of those of my forebears (and their descendants) who first came to Australia, either alone or with their families. Most of these first arrivals came as assisted emigrants although two, Samuel Hickmott and John Cheeseman, were transported to Van Diemen's Land and New South Wales respectively. The first arrivals on my father, Laurie Cheeseman's side were: Benjamin Cheeseman and Clara Jane Cheeseman (nee Bass) from Kent in England, John Saunders Wright and Sarah Wright (nee Bodger) from Huntingdonshire, Thomas John Kersley from Hampshire, Bridget Buckley from County Cork in Ireland, and Alexander and Catherine Laurence (place of origin unknown but probably Ireland). To see Laurie's known forebears, click here. The first arrivals on the side of my mother, Elsie Cheeseman nee Hickmott (pictured on the left), were Samuel Hickmott, Henry Hickmott and Sophia Hickmott (nee Goldsmith) all from Kent, William Free and Eliza Flavell from Cambridgeshire, Elizabeth Ann Owen from Wales, John Shepherd from Devonshire, and Johanna Mulchay from County Galway in Ireland. My mother's known forebears are shown here. All arrived in Australia in the 1840s or 1850s. Some were forced by economic necessity to move from their loved ones and familiar surroundings and try their luck on the other side of the world. Some were lured by the stories of the gold rushes and the prospect of making their fortunes. All came from the labouring classes and, as such, had to work hard to support themselves and their families. It is likely that none had any real idea of what lay ahead of them, or of the hardships and heartaches they would have to endure. While none made a fortune, all remained in Australia and became part of the pioneering families of Victoria, New South Wales, Queensland and Western Australia. John Shepherd and Johanna Mulchay. Or click here to see a full listing of the web pages contained on this site, and here to see some of the newly received photographs. You can also use the box below to search the site for names, places or any other information. Other websites containing information about one or more of our 'first families' are shown at Useful Links. 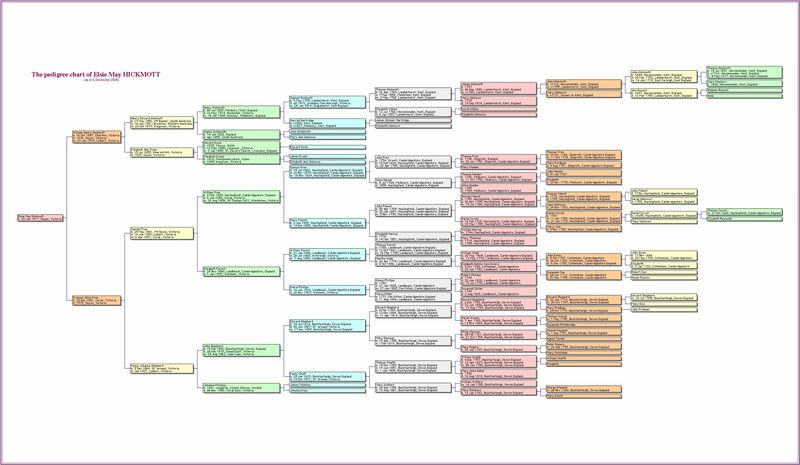 Listings of births, deaths and marriages, compiled for some of these and related families from various parish registers in the United Kingdom, are shown here. In September 2011 the 'First Families' website was included by the Australian National Library on its Pandora web archive. This comprises a growing collection of Australia's online publications and involves such other collection partners as the Australian War Memorial, National Film and Sound Archive and the various State Libraries. The webside has been re-archived each year since 2013 ensuring that the people, photos and stories described within it will be available for public viewing well into the future. John and Rebecca Goldsmith of Maidstone in Kent. Click here for more details. E-mail correspondence with Jan Saunders from northern NSW has provided us with a further Australian Hickmott connection. This is George Charles Goddard (1873-1927), a grandson of our Henry's older brother Edward Hickmott. Born at Calcutta in India, George married Olive Christine Hurley (1875-1948) at Cardiff in 1901. George travelled to Western Australia in 1909 and Olive and their two children joined him there two years later. 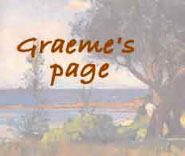 George worked for a time at Broome and, from 1923, at Margaret River as part of the Group 60 Settlement Scheme. He died at Margaret River in 1927, Olive died at South Perth in 1948 and is buried with George in the Karrakatta cemetery. They had three children: a veteran of Tobruk, George Leonard Goddard (1902-45), who married Gladys Jean Sourrness (1907-95) at Mount Barker in 1932 and had two children; Eileen Mary Goddard who married a Gallipoli veteran, Leonard Dunkley (1893-1976), in Perth in 1939; and Olive May Goddard (1915-94) who married Edgar Robert Howard Gliddon (1917-68) in Perth in 1941 and also had two children. In 1852, Devonshire-born Edward Shepherd (1814-87) his wife Fanny and their six children, emigrated from England to Australia on the sailing ship the STEBONHEATH. They first lived and worked on the Sutherland (later Rich Avon) sheep station on the Richardson River near Cope Cope and then the West Charlton run at York Plains. Edward selected and farmed land at Gooroc near Coonooer Bridge before, in the late 1860s, moving to Bald Hills near St Arnaud where Fanny died in 1871 and he in 1887. Their children all grew into adulthood, married and were pioneer settlers in the central and northern rural areas of Victoria. To date we have reviewed the children and descendants of four of Edward and Fanny's six children: their eldest daughter, Mary Lee (1834-91), their two eldest sons, Edward (1839-1919) and John Shepherd (1842-1918) and their youngest son Robert Shepherd (1846-1932). Mary was twice married, first to the former convict George Lee (1820-72) and second to Port Glasgow-born William Fife (1839-1931). She had only one child, her namesake Mary Lee (1854-1910), who married a Cornishman, James Henry Medlyn (1843-88), at Carapooee in Victoria in 1873 and had six children. Edward Shepherd married an Irish woman, Matilda Lynn (1841-1919), in Melbourne in 1865. They had seven children: Jane Elizabeth Ryan (1866-1926), Edward (1867-1946), Thomas Chaffe (1869-1945), Robert James (1871-1934), Phoebe Emily Moore(1873-1909), John Finlay William (1875-1938) and Matilda Catherine Whelan (1877-1943). The description of Edward and Matilda's children and descendants is presented in three parts. Part 1 covers Jane Elizabeth who married Martin Ryan (1864-1928) at Wycheproof in 1889 and had 13 children. Part 2, covers their next five children, and Part 3 describes the family and descendants of Matilda Catherine who married James Daniel Whelan (1869-1942) at Wycheproof in 1898 and had 11 children. John Shepherd and his Galway-born wife, Johanna Mulchay (1841-1900), were married at Cope Cope in Victoria in 1862 had nine children: Mary Jane Cook (1863-1933), Fanny Johanna Free (1864-1927), Johanna Free (1866-1937), Elizabeth Ann (1868-1940), Susan Maria (1870-77), Jessie (1874-77), John William (1875-77), Lucy Catherine Myles (1878-1932) and Annie Frances Reilly (1881-1947). Edward and Fanny's youngest son, Robert Shepherd married Adelaide-born Mary Ann Seales (1853-1926) at St Arnaud in Victoria in 1868. They had seven children: Mary Ann Bryant (1869-1956), Annie Louisa Allen (1871-1913), Ann Ellen Allen (1877-1923), Fanny Wandel (1875-1954), Robert Shepherd (1881-1945), Elizabeth Victoria Brown (1882-1961), Ellen ('Ellie') Walder (1883-1962) and Edward Shepherd (1887-1970). Using the National Library's Trove database and other sources, we have put together the story of Edith Olive Lewis (1885-1912), the sixth child of Henry Edward and Elizabeth Ann Hickmott nee Owen, and her family and descendants. Born at Charlton in Victoria in 1885, Olive married Herbert Digby Lewis (1871-1972), son of George Sugden Price Lewis and Catherine Ellen Maguire, at Lalbert in 1903. She and Bert had four children at Lalbert before Olive's sad and untimely death there in 1912. Using Ancestry, the National Library's Trove database and other sources we have re-written and updated what we know of the life, times, family and descendants of Samuel and Fanny Free nee Shepherd. 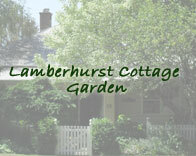 Married at St Arnaud in Victoria in 1891, Samuel and Fanny farmed first at Corack and then Lalbert in Victoria's Wimmera district. They had ten children between 1892 and 1908, five of whom married and had children and grandchildren of their own. Two of their sons, Samuel John and Albert Ernest Free, served on the Western Front during the First Wold War. A detailed account of their experiences and those who remained at home can be read here. We have also updated what we know about the family and descendants of Samuel's brother, James Free (1864-1922) and his wife Johanna Shepherd (1866-1937). Married at St Arnaud in 1891, they also lived at Corack and then Lalbert and had 12 children between 1892 and 1911.
we have not been able to trace beyond a certain period or date. Samuel Hickmott was transported with his brother, Thomas, to Van Diemen's Land in 1840. After being granted a certificate of freedom in January 1850, he travelled from Tasmania to South Australia where his son, Henry Hickmott, was then living. In around 1856 Samuel left South Australia for the Victorian goldfields (we think he may have accompanied Henry and some of his colleagues on their overland journey to Bendigo but have no evidence for this). Our last sighting of Samuel was in January 1872 when he was admitted to Victoria's Maryborough and District Hospital (Henry was registered as living at Maryborough late in 1871 prior to taking up land at nearby Charlton). The hospital records don't indicate how long Samuel remained a patient, merely stating that, on discharge, he was 'sent to his friends'. We have not been able to trace Samuel after this or ascertain when and where he died and was buried. It is possible he joined Henry at Charlton, or went to Warrnambool to where his brother Thomas had moved in the 1860s (Thomas died and was buried at Warrnambool in August 1871. Or he may have gone somewhere else entirely. The search continues. Together with his wife, Jane, and three small children, Benjamin Cheeseman emigrated from England to Australia in 1853. 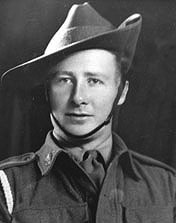 He was contracted to work for a James Egan of the Major's Line station near Heathcote in central Victoria for a period of six months. It seems that after completing their contract with Egan, Benjamin and Jane left Heathcote for the Maryborough and later the Ararat goldfields. Some time between 1854 and 1866, Benjamin died where the versions of what happened to him differ slightly. Some in the family thought he died of thirst on the 'Old Man's Plains' while trying to walk to the Orange goldfields in New South Wales. Others thought he was found wandering in a state of delirium on the 'Emu Plains' and was taken to the Ararat mental asylum where he died soon after admission (this was more likely Jane's second husband, William Henry Robinson). Whatever the truth of the matter, we have found no official record of Benjamin's death or of his burial - his final whereabouts remains a mystery. Christina May Hickmott was one of Samuel Hickmott's great grand-daughters (the third daughter of Alfred Hickmott and Alice McLeod). She was born in Kookynie in Western Australia in 1905 and married Bruce Ray Overbeck (1914-67) in Melbourne in 1933. Bruce, who served in the 2/12 Field Artillery Regiment during the Second World War, was the son of Charles Augustus Overbeck (1873-1953) and Caroline Sophie Louise Helena Hoffmann (1888-1976). We think they either separated or were divorced after the war. Bruce went to Sydney to live and work as a baker. 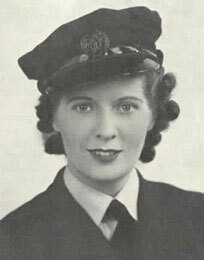 Christina was in Melbourne at the time of the 1949 election but thereafter disappears from the electoral roll. We suspect she re-married but have not been able to confirm it. Nor do we know if she and Bruce had any children. One of Benjamin and Jane's grand-daughters, Emily Grace Cheeseman was born near Morchup in central Victoria in 1889 and married Victor James Mills in Melbourne in 1911. They had had two boys by the time Victor enlisted in the First AIF and departed for overseas service in 1916. Emily and her boys lived with her family at Beaufort during the war. 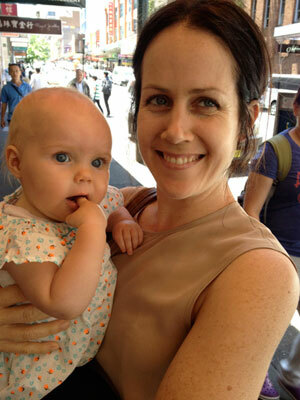 On hearing Victor was coming home, Emily took the boys to her mother-in-law's at Ballarat and left them there. According to her niece she feared resuming her life with Victor and saw leaving him as her only way out of 'a bad marriage'. Sadly her decision also led her to be separated from, and ostracised by, members of her own family. 'Aunty Ada was the last of the family to see her, long after we went to the Mallee, Ada just shut the door on her, said she was with an Army officer and was well dressed'. Some in the family believe Emily had a daughter, Shiela Grace Cheeseman, who was born after the war although we have been unable to confirm it.